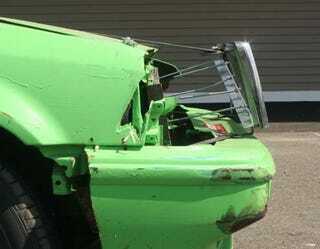 If you're one of those drivers who likes to bump other cars at the 24 Hours of LeMons- hey, those slow bastids are in your way, right?- you might well find the Grille Of Damocles menacing your radiator. The much-feared Grille is a Volvo unit fitted with long rods, attached to your front bumper in such a way as to guarantee a ventilated radiator in the event of even minor contact with the bumper of the car in front of you. While the Honda CRX is generally considered too fragile to throw its weight around a LeMons track (and also small and nimble enough to squeeze past the sluggards), Team Go Green managed to "win" this special award today. Jump away to see more of UDMan's photos.